This module demonstrates techniques for developing a hydrologic forecast verification effort. Although it can be taken as stand-alone training, the module on Introduction to Verification of Hydrologic Forecasts is intended a useful prerequisite. Through the use of rich illustrations, case study examples, and review questions, this module provides an example of developing a verification effort using NWS verification tools. Two case studies will be highlighted that both look at the primary question of whether QPF input to hydrologic models improves the hydrologic forecasts. Related questions of QPF's impact on hydrologic forecasts are explored that include considerations of basin characteristics, forecast lead time, and event magnitude. One case will look at verification of deterministic stage height forecasts using the Interactive Verification Program (IVP) at the Ohio River Forecast Center (OHRFC). The other case will look at the verification of ensemble flow forecasts using the Ensemble Verification System (EVS) at the Middle Atlantic River Forecast Center (MARFC). 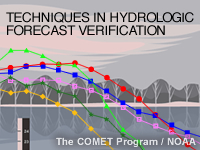 Understand how to develop a technique for verifying hydrologic forecasts. Apply knowledge of verification scores to real hydrologic forecast case studies. Develop meaningful and specific questions to be explored with hydrologic verification (for example: How does QPF in the hydrologic model impact the hydrologic forecasts?). Develop meaningful subsets of data to more fully understand forecast performance based on forecast variables like lead time, basin characteristics, and event magnitude. Evaluate forecast data characteristics important to verification (for example: sample size and data distribution). Verify different aspects of hydrologic forecast performance (for example: error, bias, calibration, skill, correlation, reliability, discrimination, and confidence). Identify sources of error and uncertainty in the forecast process. Become familiar with some of the uses of NWS verification tools. July 2014: Since publication of this lesson new features have been added to the NWS AWIPS verification system. This lesson remains useful, but NOAA users are advised to check with NWS internal training as well for updates.